Someone had finally asked the dreaded question. The problem? I didn’t have a refund policy. Let’s face it: I was scared. I sent the email and then spent the next several days pondering the issue. What I realized is that I was approaching the situation from my own perspective. See, I was thinking of the blood, sweat, and tears I spent making these courses. Those of you who have been following my journey know that I’ve poured everything into Learn Lettering. I phased out of client work and spent 6 months of my time and 5-figures of my money investing in building this thing. I know how much value is in these courses. The problem is, the potential customer doesn’t. The focus on my investment as the product creator caused me to believe that only someone who was intending to take advantage of me would ever request a refund. Selling digital products with a Money Back Guarantee is scary! There’s no physical product being returned to recoup costs. The customer can fully consume the digital product and then request a refund, effectively stealing the product. But this is the wrong perspective. The focus should be on the customer and they value they are getting. 1. Focus on the value to the customer. At the end of the day, it doesn’t matter how hard you worked building something. It matters how valuable that solution is to the customer. If a customer contacts you and says that your product was not valuable to them, would you still insist on keeping their money? If my product didn’t help this person, I need to take responsibility for not making my value proposition clear. Obviously, I did not do a good job communicating what the product accomplishes and who it was for. 2. Build trust with the customer. Bad people are going to be bad people. Those who want to steal will find a way. It’s like what they say about locks: they keep the honest people honest. That’s it. My mistake was thinking that offering a Money Back Guarantee was going to promote fraud and encourage scammers. The problem? Scammers gonna scam. When you refuse to offer a Money Back Guarantee, you’re catering to the wrong kind of customer while simultaneously estranging the right kind of customer! A Money Back Guarantee will build trust with the right kind of customer. When you focus on the wrong kind, you’re effectively saying that it’s more important to protect yourself from people who will find a way to steal from you anyway than helping those who won’t! What you should be focusing on is building trust with the person who wants to compensate you for the value you’re providing. 3. Eliminate hesitation and sense of risk for the customer. You have what the customer needs, they just don’t know it yet. Your job is to convince them that your product is the droid they’re looking for. Thoroughly describe the audience it’s intended for. Thoroughly describe the benefit provided. Decrease perceived risk in purchasing. The last one is key. Not only have you set the stage by convincing them that you understand their problem and have meticulously crafted the solution, but you’ve underscored that there is no risk in purchasing that solution. 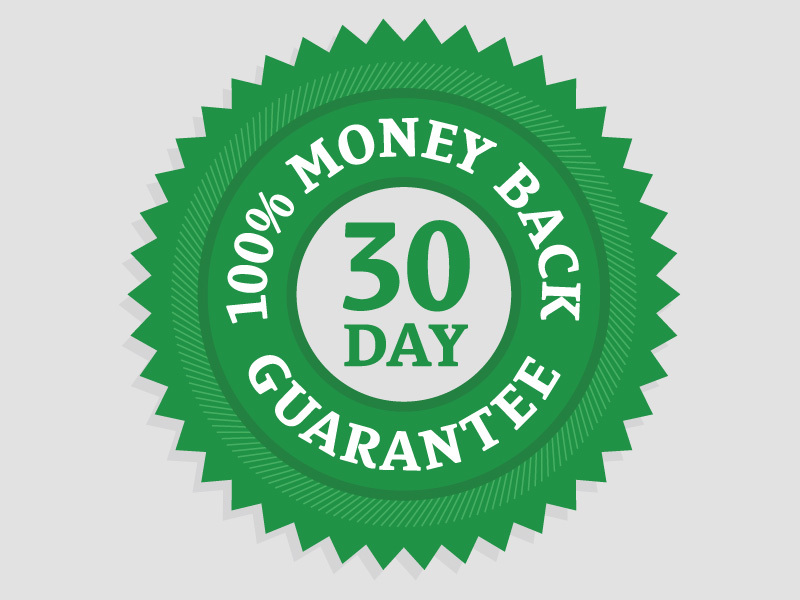 Let’s break down why Money Back Guarantee are a smart decision for your business. First of all, if someone wants to cheat you, they will find a way to cheat you. The wise musicians don’t focus on piracy—they focus on making more awesome music which creates the kinds of rabid fans that will actually compensate them. You know your product is good, right? Instead of using that confidence in your product to say that you don’t do refunds, channel that energy into offering a no-questions-asked refund policy. You’re communicating to the customer that you don’t want their money if they didn’t get value. When you have the confidence and guts to back your products with a Money Back Guarantee—especially a digital product—that shows the customer that you care about their satisfaction and the value they received. It tells them you’re an upstanding business that is focused on providing value, and you’re not just a money-grab. This builds trust. Trust translates into fans. Fans turn into future sales. Future sales from fans creates rabid fans. This is the cycle you want perpetuated. You want to fuel this cycle and that begins with building trust. You might think $250 for a product is a lot. You might be worrying that you’ll “lose” $250 if the customer requests a refund. The trust you build with a $250 product can translate to sales of an even higher-tier product later on. Adopt the Long Game Mindset. Having a Money Back Guarantee tells the customer they have nothing to lose. When you’re so focused on the fear of refunding the money you already made, you miss the fact that many potential sales are never happening at all because of hesitation. Hesitation comes from perceived risk. If you’re worried about keeping the money from your current sales regardless of whether the customer who paid you actually received value, you’re being stingy. You know what the price for that stinginess is? Never noticing all the sales that aren’t taking place. If your product is actually any good, and you do half a decent job on your value proposition, you might refund 1 or 2 out of every 50 sales when you implement a Money Back Guarantee. In this shift from focusing on fear to focusing on value, you’ll likely find that you’re now getting an extra 5 or 10 additional sales per 50. Your building efforts don’t matter—the value to the customer matters. Starting with fear is the problem. Focusing on value is the answer. I gave the example of refunding 1 or 2 products out of 50. Let’s say you only make an additional 2 sales when implementing a Money Back Guarantee policy—effectively breaking even. Ok, so you didn’t increase your profit. Still no problem! What you did increase is trust and loyalty. Those two things will translate to profits down the line. What is your brand perception worth to you? Don’t trade a short term dollar for long-term loyalty. At the end of the day, it doesn't matter how hard you worked building something. It matters how valuable that solution is to the customer.